Is the San Francisco Fur Ban Working? The managers of Saks Fifth Avenue failed to produce invoices that would prove that their fur was compliant. San Francisco’s fur ban went into effect on January 1 this year, but as the new year started, Saks Fifth Avenue did not put away the fur. They are claiming to have taken advantage of a loophole in the law. They claim that the fur they have for sale was purchased prior to March 20, 2018 when the fur ban was passed, which would allow them to sell the fur until the end of 2019. However, when Almira Tanner, who is a member of the Direct Action Everywhere (DxE) Steering Committee and DxE’s sister group Compassionate Bay, and other activists went into the store to see if it is compliant with the law, the managers of Saks Fifth Avenue failed to produce invoices that would prove that their fur was compliant. 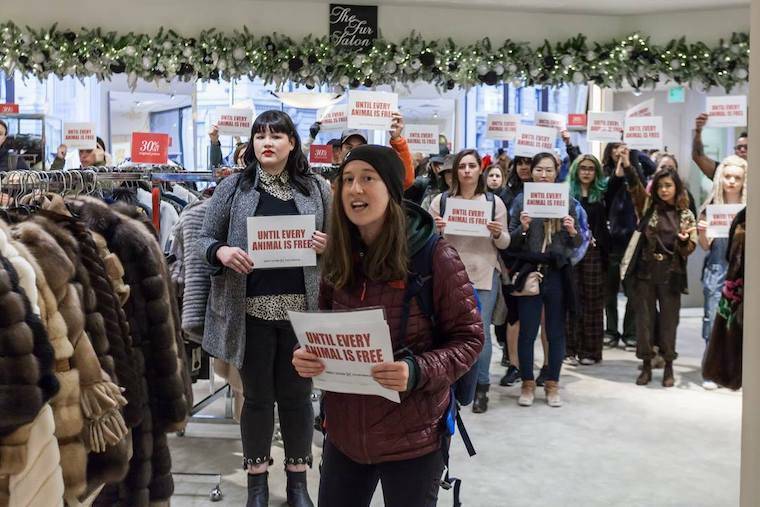 The next day, on January 2, a DxE activist went again to Saks Fifth Avenue to check on the fur. He saw fewer items out this time. But there were still around 90 pieces out. Amira Tanner says, “Saks Fifth Avenue blatantly disregarded the spirit of the law. The city of San Francisco clearly said that they don’t want fur to be sold anymore in the city.” Almira Tanner contacted the San Francisco Department of Health so that they can enforce the fur ban. The Department of Health took action and requested the stores provide invoices for their inventories of fur. On January 10, the department granted extensions for providing records to several of the stores, including Saks. Nonetheless, Almira Tanner contends that the SF fur ban is still a huge success. She says, “We set a precedent of banning fur.” Now California legislature is considering banning fur statewide. Almira Tanner says that another reason she’s excited about the fur ban is because it happened for ethical reasons. She says, “If you look at the way the law is written, it says that San Francisco is a city that does not support cruelty towards animals. So the fur ban is based on ethics.” Almira believes that this law also paves the way for San Francisco to pass other measures that help animals. Almira Tanner believes that next San Francisco may be open to passing a ban on leather as well as a transparency bill known as the Right to Know. This bill would require retailers to disclose factual information about the animal products they sell. For example, it would include information such as whether the animals were mutilated and their age at slaughter. Almira believes that ultimately, San Francisco will ban the sale of meat as well. She says, “There are ample alternatives already available.” She says that overall the fur ban is a huge success because it moves us closer to the DxE vision for animals to be treated with compassion and respect all over the world.